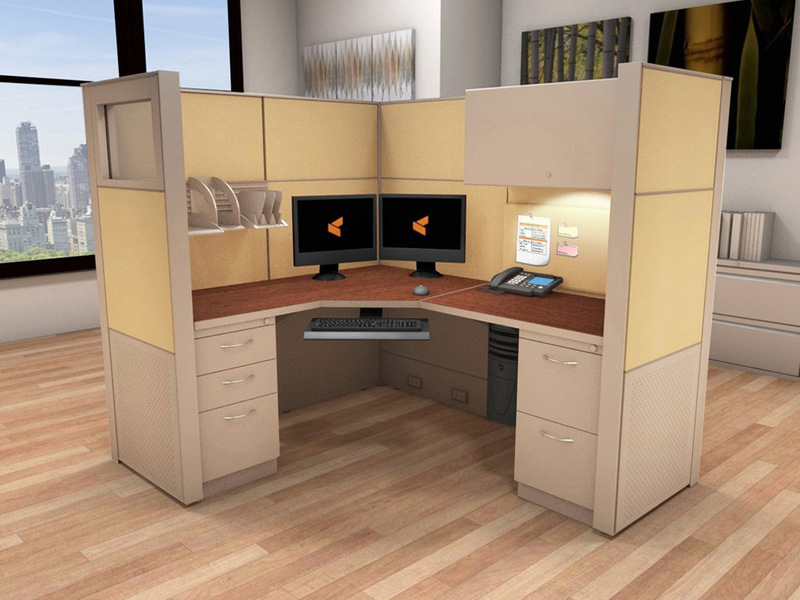 Get ready for a bold new take on cubicle systems. 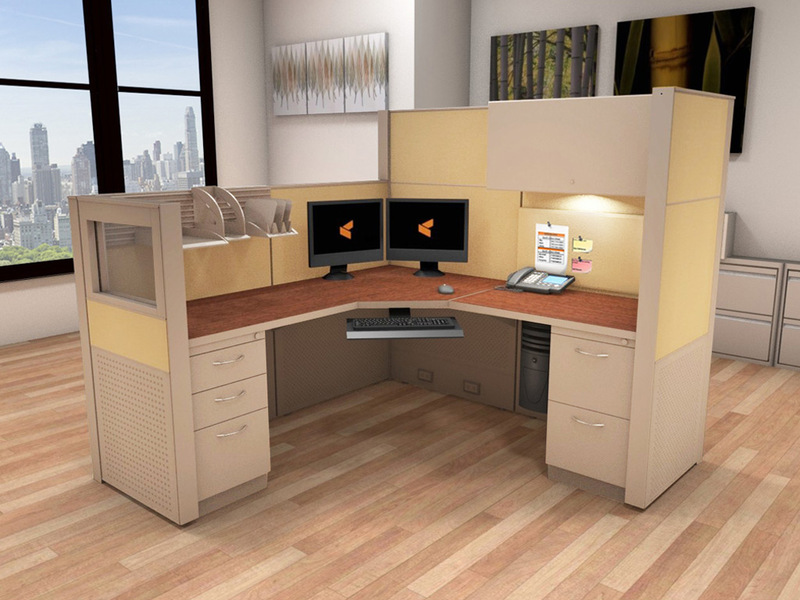 Matrix cubicle workstations are redefining the modern office. Elegant & Luxurious, Matrix systems furniture is built to please they eye. 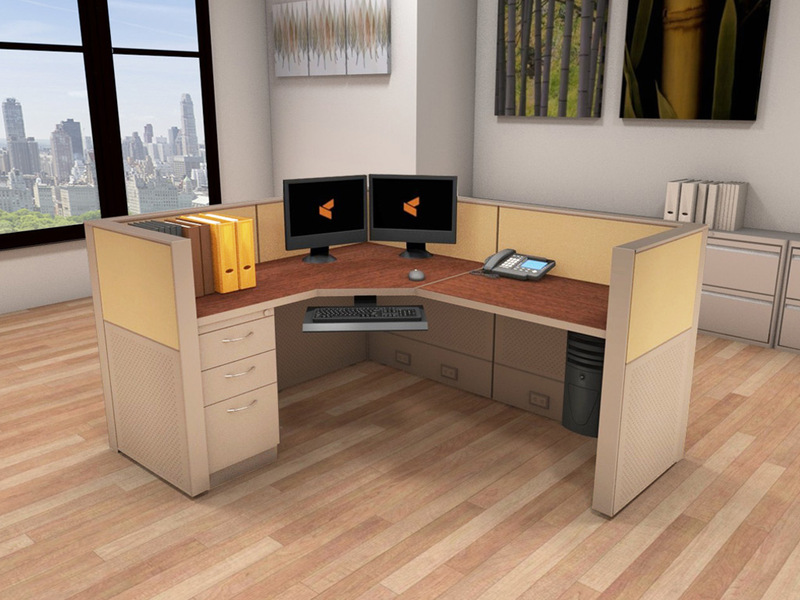 Bring out your true inner executive with Matrix systems office furniture. 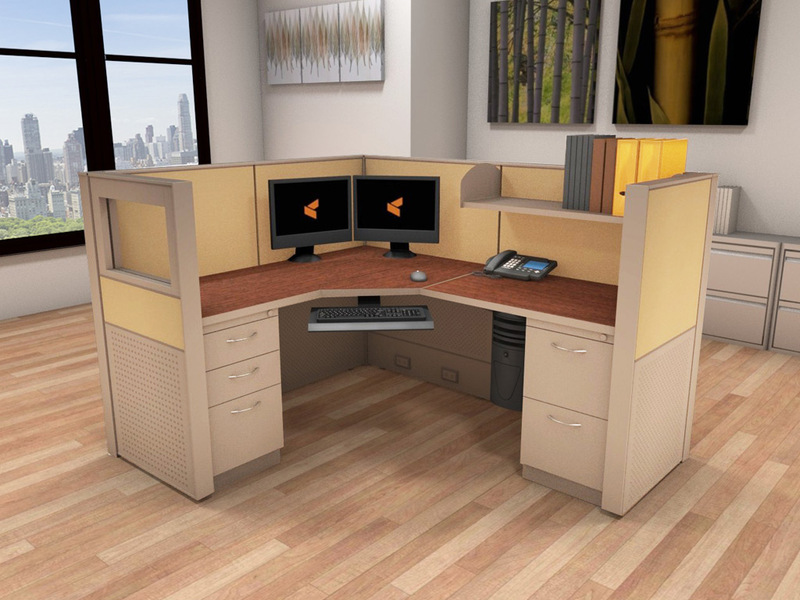 Modern office system furniture adapts to the ways we work today. Collaborate while maintaining private space with Matrix systems furniture. Stack it up high or keep it down low - Matrix tiled panels are ready to go. All work and plenty of play makes the workers happy to stay. Are you ready... to Enter The Matrix? 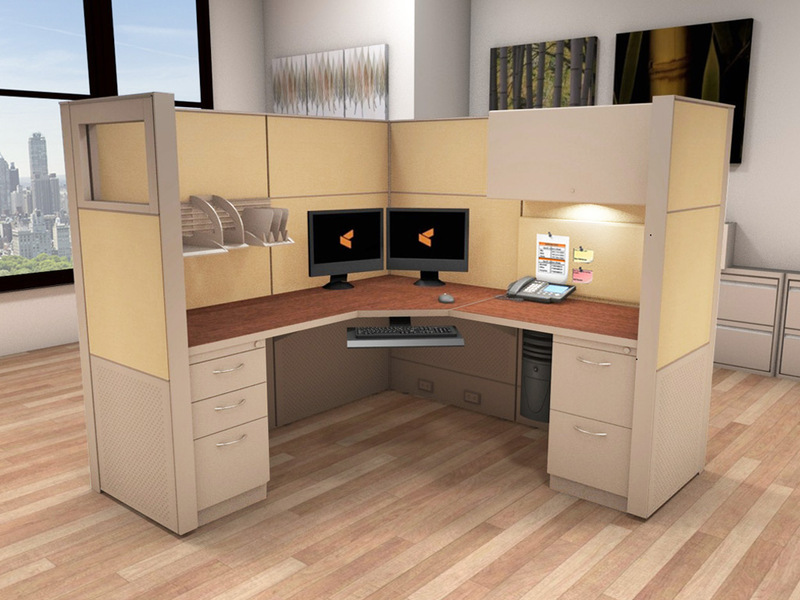 Matrix Tiled Cubicle Systems are tech-savvy and impressively eye-catching at an unbeatable price, and include FREE space planning services on orders of 6 or more units. 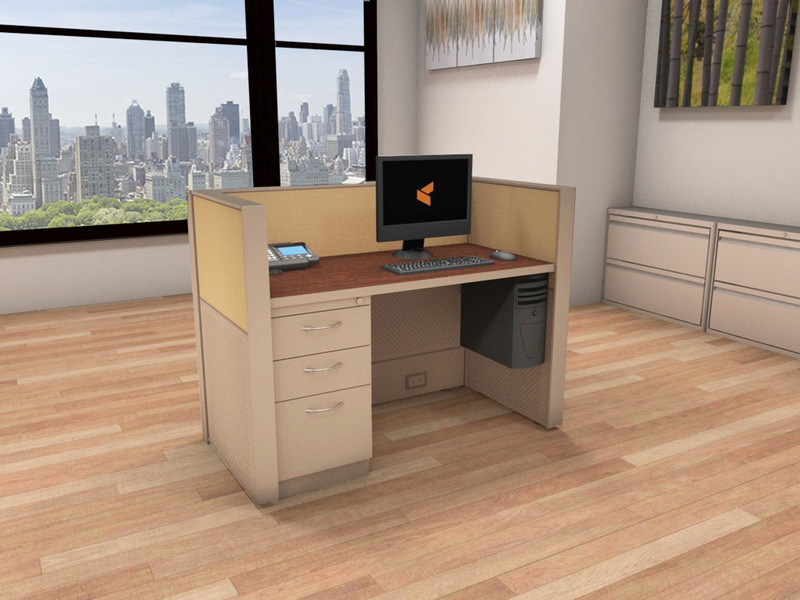 The most common footprints are 2x4, 5x5, 5x6, 6x6, 6x8, 8x8 and 8x12, but systems furniture can be “made to order” in sizes that fit your specific office space. Advertised prices are based on orders of $30,000 List Minimums. 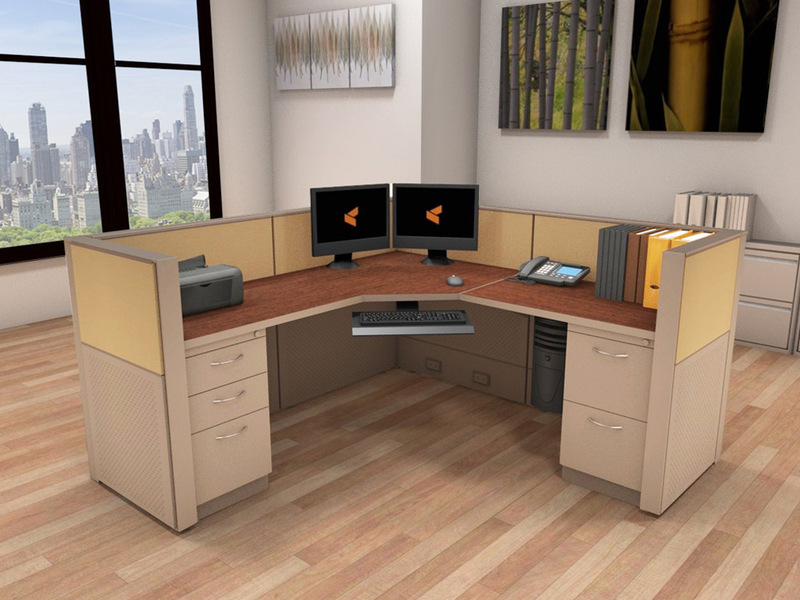 PURCHASING CUBICLE WORKSTATIONS – WHERE DO YOU BEGIN? 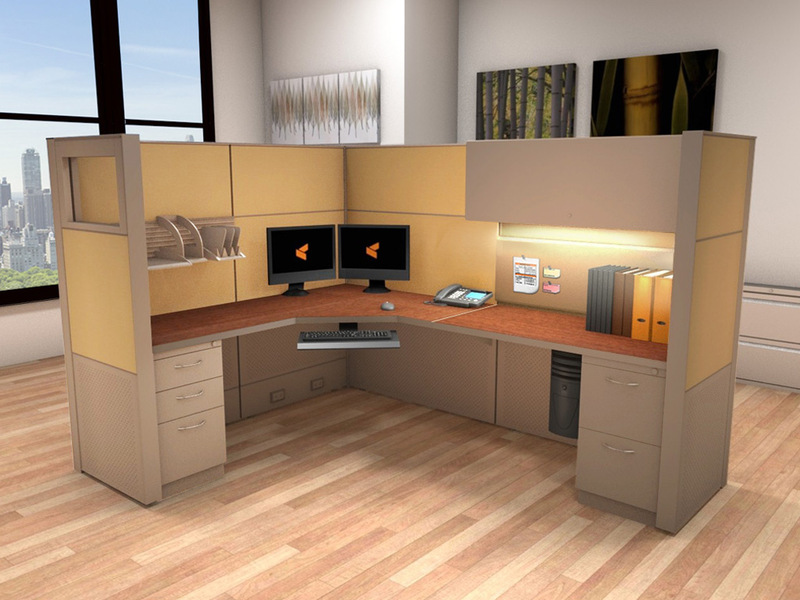 So you have a new office space and are tasked with purchasing cubicles. How do you choose? For starters, you need to determine an appropriate footprint (L’xW’), while also taking into consideration the best height (or heights) of the cubicle panels. 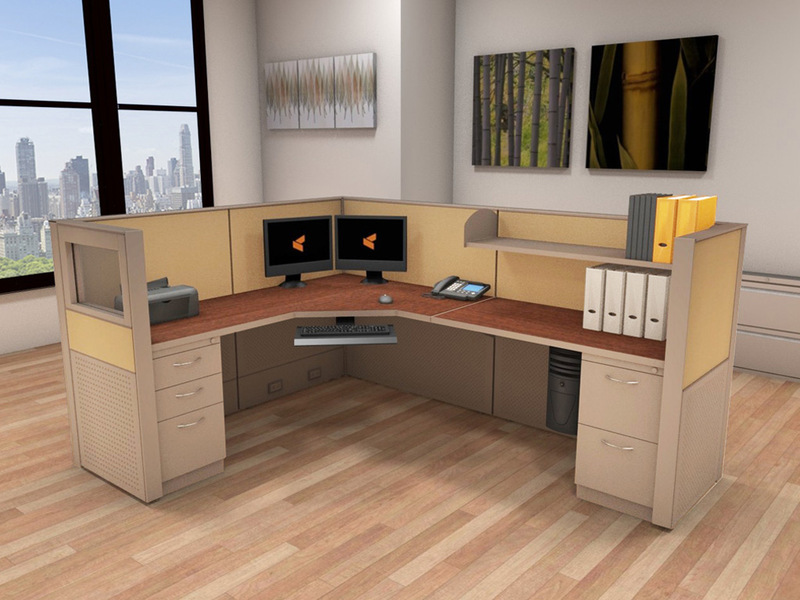 Next, you’ll need to assess what kinds of cubicle storage components are necessary, along with other beneficial accessories such as ergo features and tech gadgets. The last decisions center around making your workplace inviting and attractive, in the materials and finishes you select. 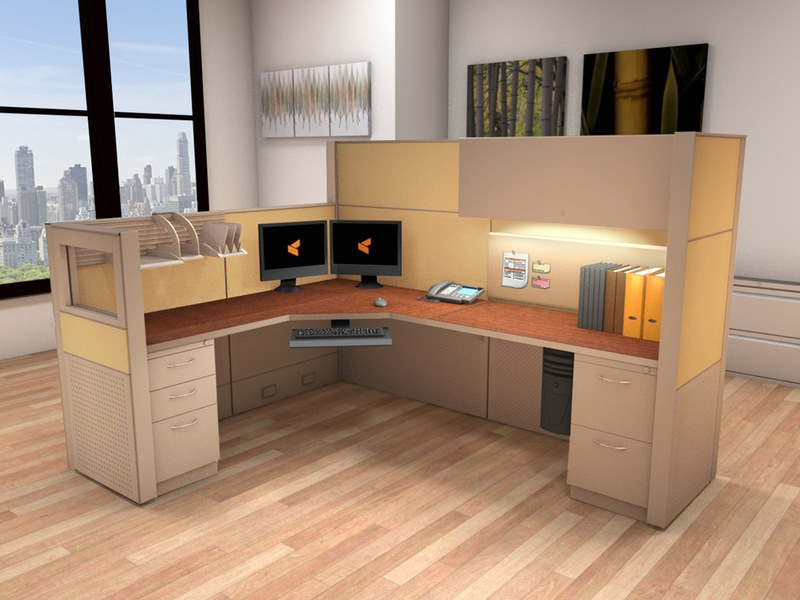 In the end, your ideal cubicle workstations really depend on the type of work you’ll be doing in them. 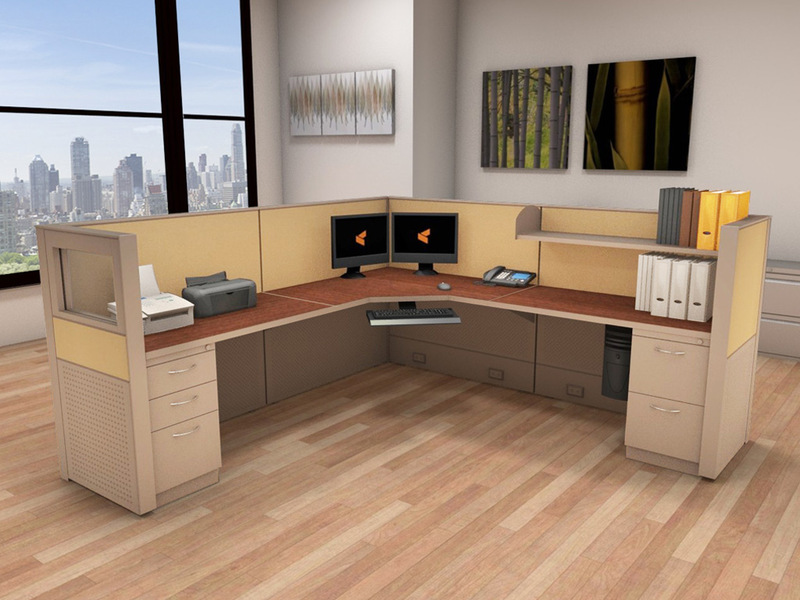 If you really want to maximize your commercial office space as much as possible, the smallest sizes are 2x4 or 5x5 workstations. 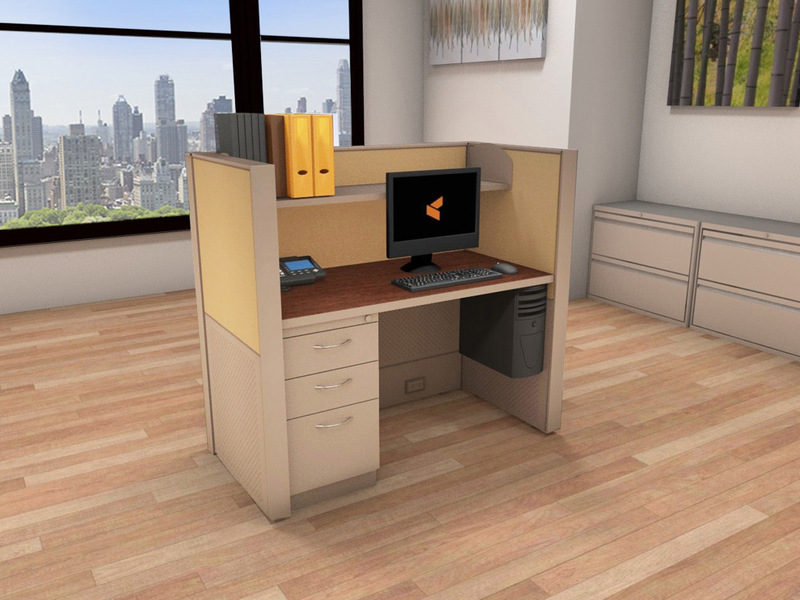 2x4’s make great call center cubicles and are widely used by telemarketing companies and others with large customer service departments. 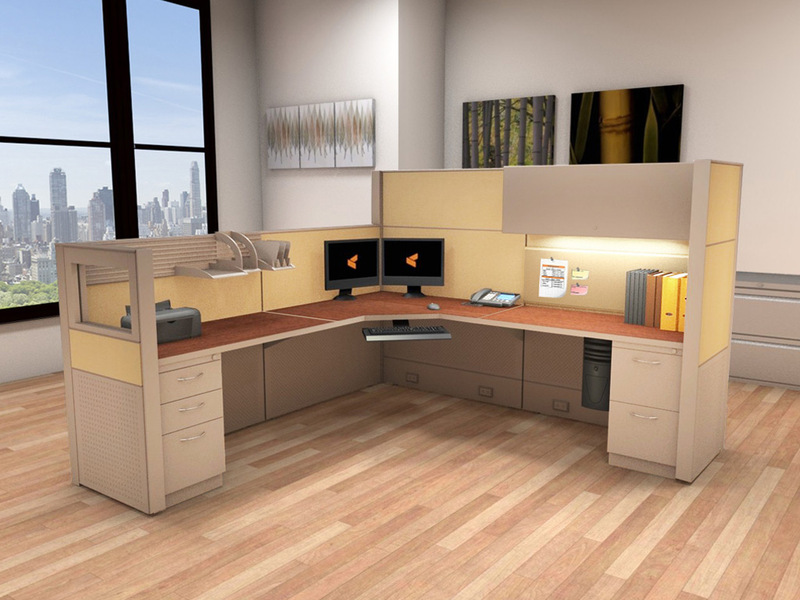 If you want L shaped office desks or cubicles, you’ll need a 5x5 or larger. Both of these sizes will accommodate one worker and one set of filing drawers (filing pedestal). Technically, with modular office furniture systems like Matrix, you can create configurations as small as 2x3 if you are incredibly tight on space, but our space planners do not recommend this. Not only is there not enough knee space to add a filing pedestal, your workers will end up feeling cramped and uncomfortable, and therefore distracted - which is never good for productivity. 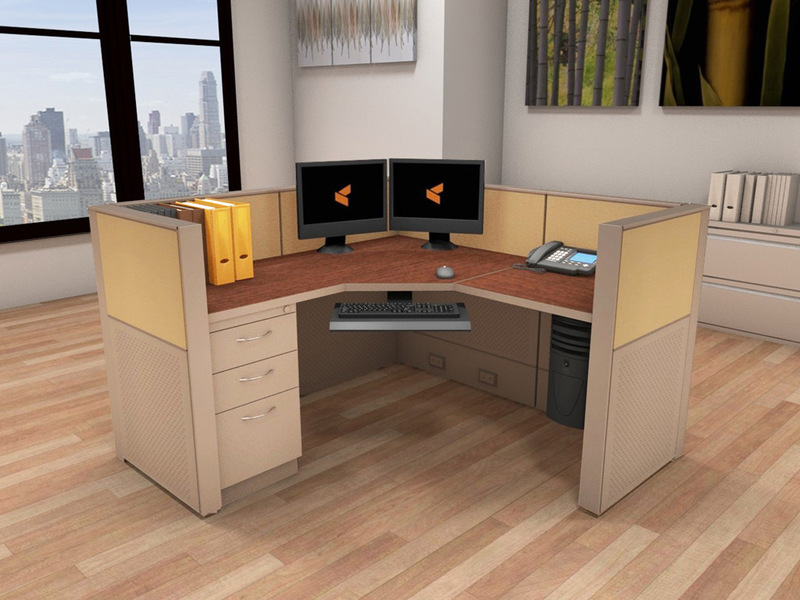 5x6 and 6x6 workstations are the most common, and widely popular among all types of industries. They offer plenty of desktop space to spread out and multi task, which is often appreciated by those in public relations, marketing and sales roles. They are also large enough to accommodate two filing pedestals, which comes in handy for administrative, clerical, and accounting departments that are often heavy on papers and files. Since personal space is highly coveted in an open office, managers, supervisors, and other seniority roles are usually rewarded with a larger 6x8 or 8x8 work station. Engineers, architects, contractors, and others who work with larger than average equipment can also benefit from the extra elbow room. 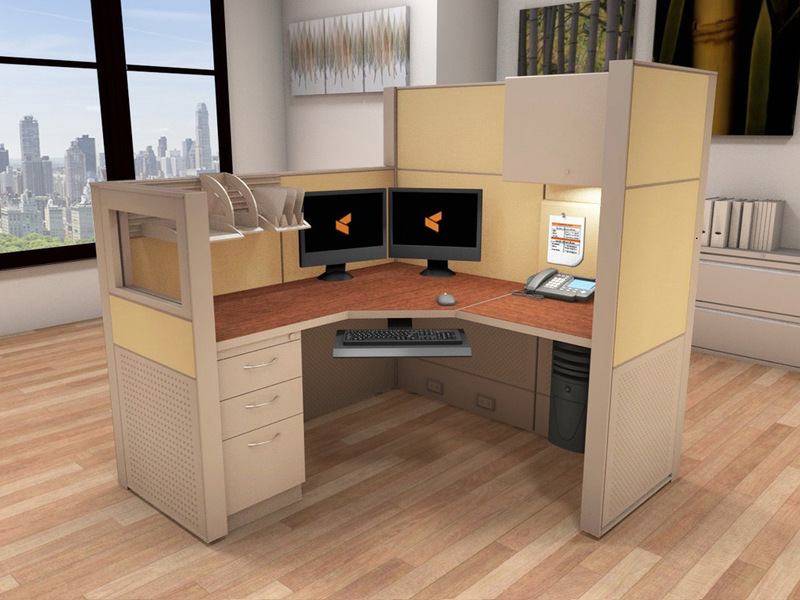 They often upgrade the standard 24” deep work surfaces to 30”, add more cubicle storage, and even create a U shaped desk space – all things you can do in a cubicle of this size. Executives and those who deal with highly classified or private information usually need a private office. When that’s not possible, an 8x12 cubicle can be the perfect answer. 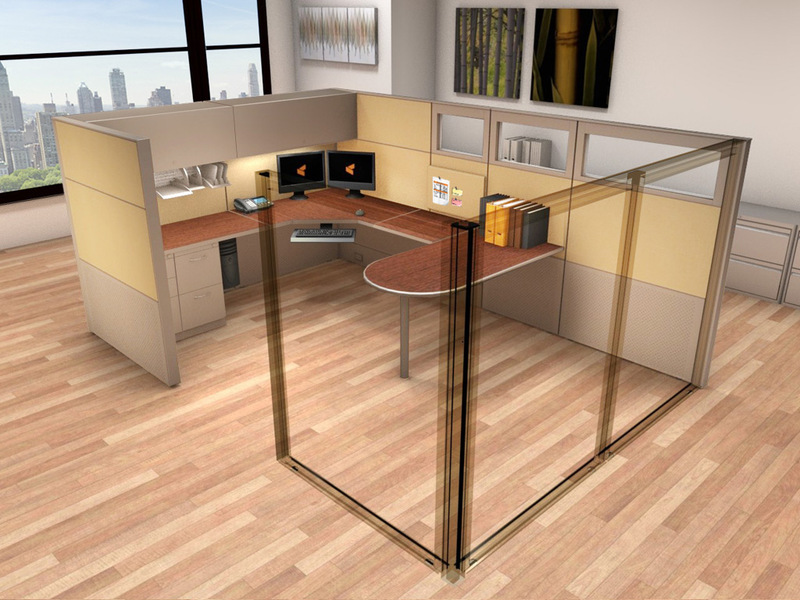 Specified to look and function like a private office, this cubicle has enough space for private meetings around the desk and when built with tall enough panels, can even have a closed and locking door. While we’re on the subject of privacy, this would be the perfect time to start thinking about the height of your cubicle walls. 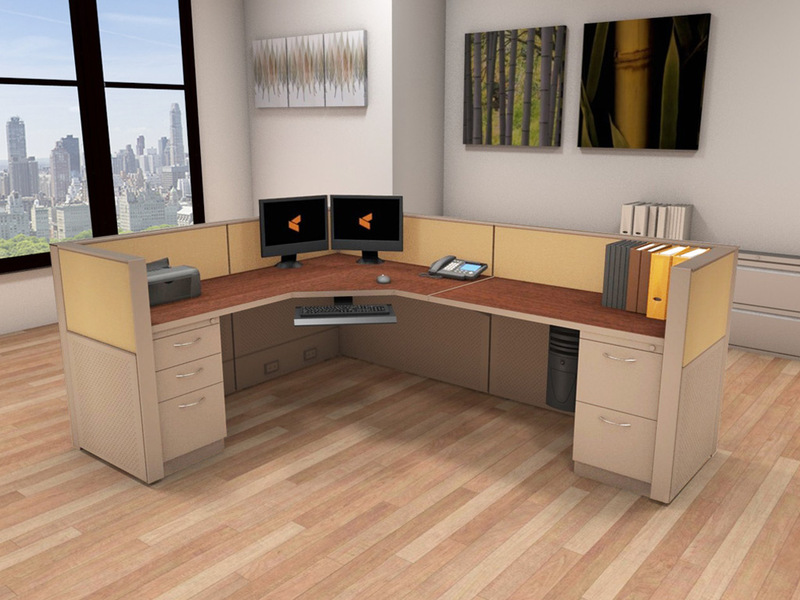 Every brand of office system furniture offers an array of low, medium, and tall privacy panels – but every brand differs slightly on the exact inch specifications. Low-privacy panel heights offered from Matrix are 42”H or lower – these are best used in areas where this is a great deal of co-working and collaboration, and the team members need to see and speak face to face while seated in their cubicle stations. 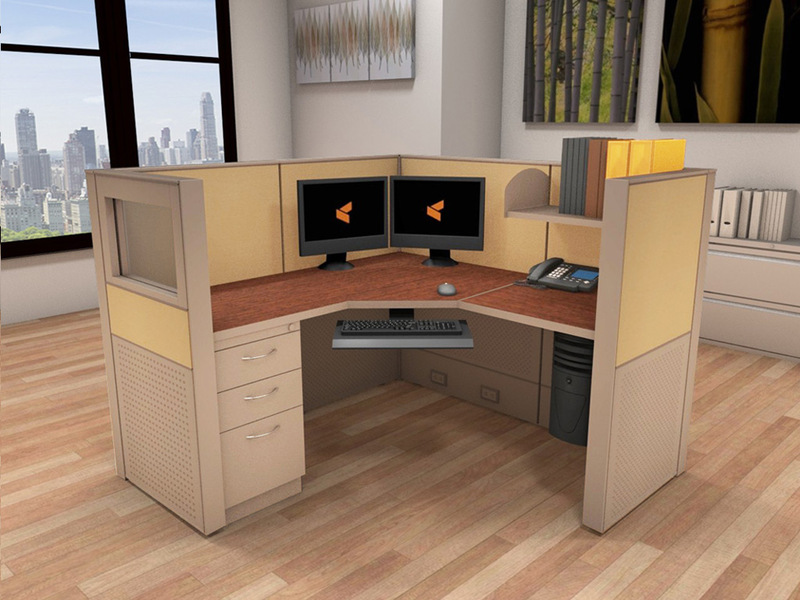 Considering the typical desk surface is at 30”H, a 34”H cubicle panel is just enough to imply borders around individual work areas, while barely feeling like a division at all. 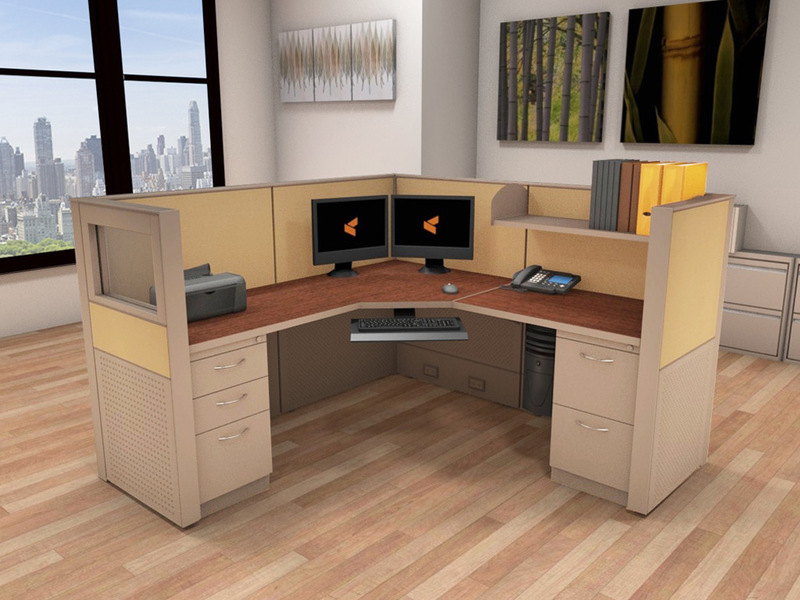 The 50” or 58”H Matrix panel frames offer a medium level of privacy, without completely closing people off from one another – some people will still be able to see over the top of a 50”H cubicle divider when seated, but it’s more than enough barrier to keep your work and the content on your computer monitors safe from the eyes of coworkers. 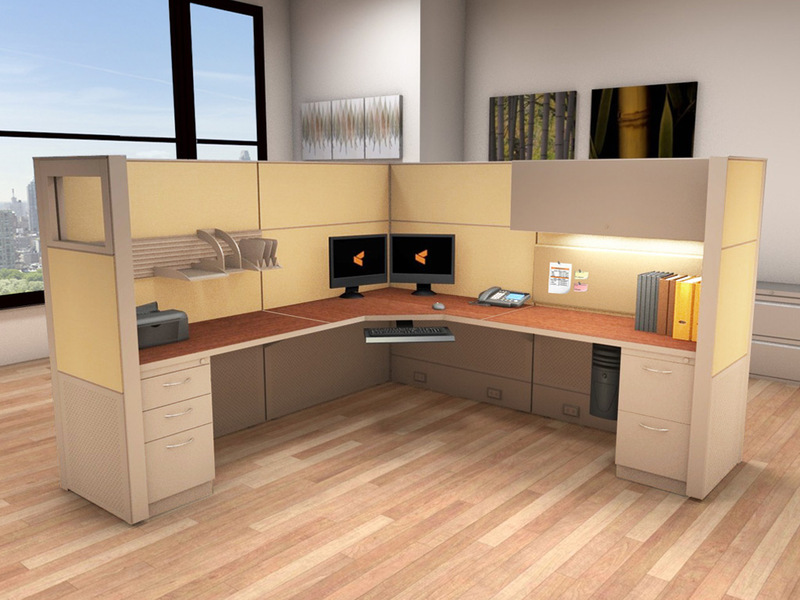 You should choose high-privacy cubicle walls of 66” or more when the work at hand is primarily independent and requires focus. 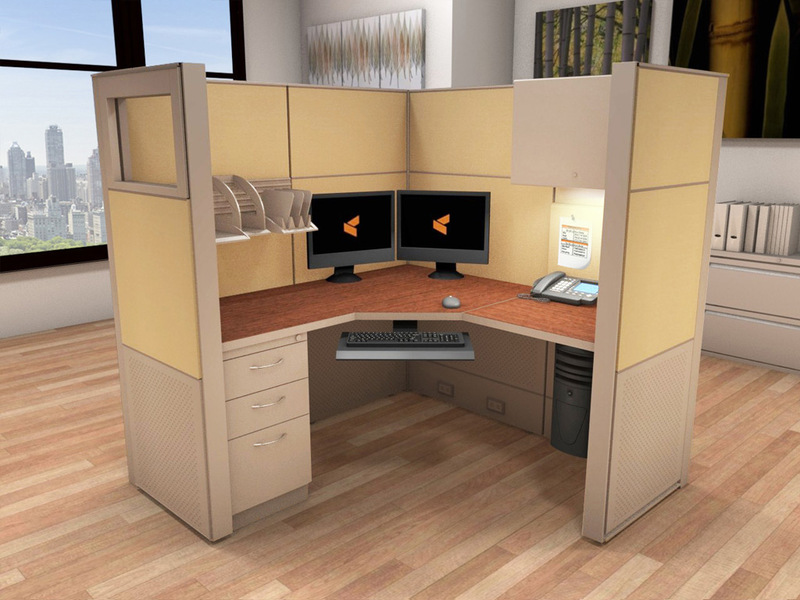 Higher cubicle panels mean less interaction, less visual distraction, and less noise interruptions. But don’t feel like it has to be all or nothing! Many of our clients prefer that we create a space plan that can give them the best of both worlds. We often use a combination of panel heights in strategic locations to give a proper balance between interaction and privacy. 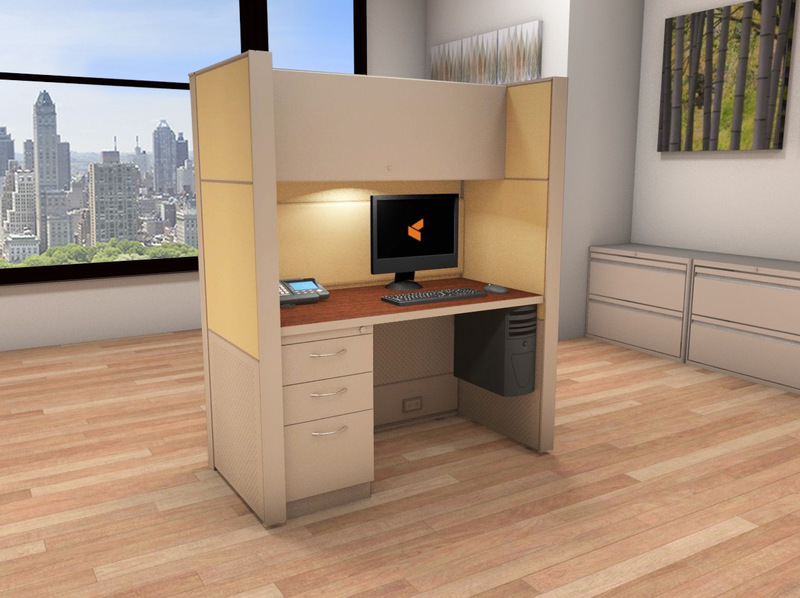 After the important basics of LxWxH are covered, now you can start thinking about adding functional details to the interior of your cubicle workstations. Storage and organization are the main focus for most office cubicle accessories and the #1 seller is a filing pedestal with either 2 or 3 drawers. Other options include overhead shelves or locking bins, hanging paper trays, and even tack boards and marker boards can help tame clutter by providing a home for all those paper notes… and mental notes. You may also consider ergonomic accessories that support better posture, like keyboard trays and monitor arms. If you have a shelf or overhead bin, attach a task light to the underside to help prevent eye strain. Even small additions like coat hooks and desktop power/data hubs can make your cubicle more convenient and worker-friendly. Colors and Fabrics and Trim Paints – Oh My! Systems furniture has come a long way since the traditional hum drum basic grey work desk of 50 years ago. 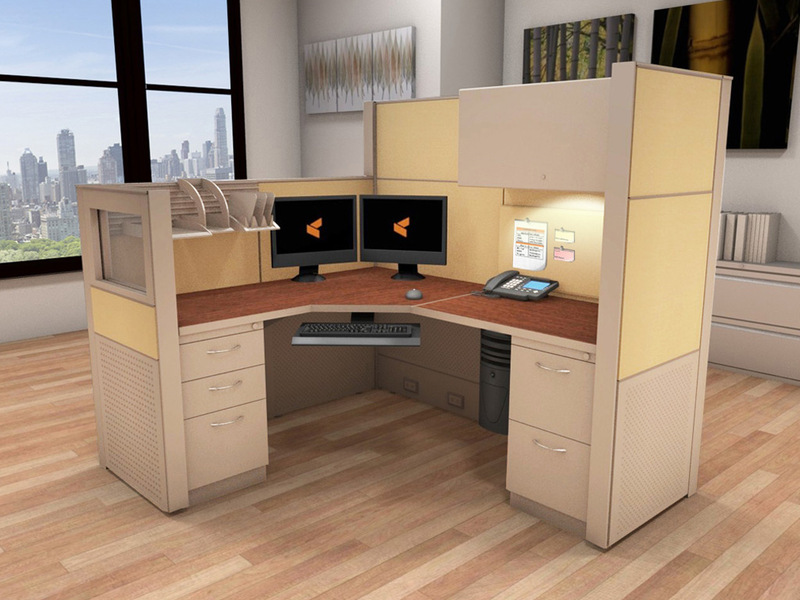 With today’s modern cubicles you have an array of design options at your fingertips. It’s amazing what you can accomplish with a visually pleasing office – guests, clients, and workers will all be happier to be there! With a frame and tile cubicle system like Matrix, every panel can be your canvas. The segmented tiles that snap into each frame can help define your office space. Use glass tiles to allow ample light to filter through the space. Use thin 8”H brightly colored tiles for a flash of corporate hues. Choose embossed or painted steel tiles for an industrial tone, or woodgrain tiles to create a sense of upscale luxury. The possibilities are endless. Have you noticed that white office furniture is incredibly popular lately? You can specify this Systems Office Furniture in ALL WHITE if you like! White desktops, white trim paint, white panel tiles – Yes, we can do that! Our featured Matrix Cubicle Systems Finishes are a selected group that offers the best lead times and the most significant cost savings. While the color options here are sure to satisfy, there are plenty more where these came from! Hundreds more, in fact. If you have something specific in mind, let us know.